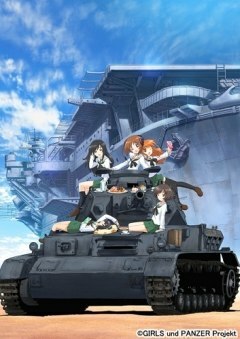 It's the feature film of Girls & Panzer! Schoolgirl tank battles! Be a girly girl and crush the world under your tank treads while shooting your friends with high explosive shells! But in a friendly way, as an after-school activity. 1. Chooses the All-Stars University team as their opponents, led by a child genius and with a record of beating even adult teams. 2. Makes it an annihilation match rather than "kill the flag tank" when even the latter would have been ridiculously hard with eight tanks against thirty. 3. Cheats by letting the University team have a Morser-Karl siege mortar. It's a film of three parts. We begin with an exhibition match, put together from four different schools that each as usual represents a different country. Lots of action. After that, though, we switch to action-free character drama as the Ooarai Academy girls discover what's happening to them, try to deal with what comes next and (briefly) meet their families. This is entertaining too. It's a tough time for them, but our heroines are always fun to be with. They goof off, encourage each other and do silly stuff, even as they take their situation seriously and try to mend it. Part three, of course, is the battle. It's huge. It has dozens of tanks and gets almost an hour's screen time, i.e. the second half of the film, but they could easily have made it even longer. Pretty much everyone from the TV show is here, plus some new schools for luck. Fan favourite characters all get significant time in the spotlight. The tank action is insane. Everyone seems to have caught Miho Disease, i.e. thinking up battlefield tricks to make your jaw drop. Yet again, there's something irresistible about schoolgirl tank battles. The girls are cute, but the tanks are even cuter. It's that combination of massive destructive potential and lovable clumsiness. You try taking a tank around a corner at top speed and see how elegantly you're driving. Now try it again with your right treads hanging off. Or on fire. They bump into things, flip upside-down and refuse to shoot something right in front of them because their cannon barrel's too long. My only minor regret about the film is Miho. There's not enough Miho. The film's so busy making stars out of all possible fan-favourite characters that there's not enough spotlight left for our heroine. She doesn't do much in the battle until the finale, although she did manage to surprise me with the trick she came up with. (a) Continuation (Finland). Apparently Finland fought famously against the Russians in World War Two, for what it's worth. They don't make a particularly strong impression here, though. (b) Chihatan (Imperial Japanese Army). These losers, on the other hand, are hilarious. (I particularly enjoyed seeing a Japanese anime making such comprehensive fun of Japanese martial traditions, incidentally.) They're probably the film's best joke. Chihatan believe in honour at all times! Charge! Charge at once! Even if ordered to retreat! We must save face by acting as suicidally as possible! Head towards the enemy at top speed in a dead straight line, regardless of the battlefield situation! Naturally they get crushed like bugs, but are happy and chirpy anyway about having carried out their honourable duty. "Sorry! Bravery wasn't enough!" I'd have preferred some explanation of who these people were, though. They just showed up as if they'd been there all along. Mind you, the internet claims that this isn't technically their first appearance, Continuation having been mentioned in dialogue in the 2014 OVA and Chihatan having lost big-time to Kuromorimine in the anime's ep.6. Look out for Thomas the Tank (Engine), by the way. You wouldn't call this a masterpiece, but it's easily one of anime's more solid, entertaining movies. The ostensible main character's underused and the second half's one big fight scene, but it works. It's great fun. It has "punch the air" cool moments. It has jokes. It has lots of colourful characters. This film was the number one film at the Japanese box office in the week of release, by the way, and has won awards (the Sanctuary Award from the Japan Movie Critics Awards and the Best Dramatic Presentation Award from the Seiun Awards). I think I prefer the TV series for its stronger focus on Miho, but they're both surprisingly good. "We were taken out gloriously!"